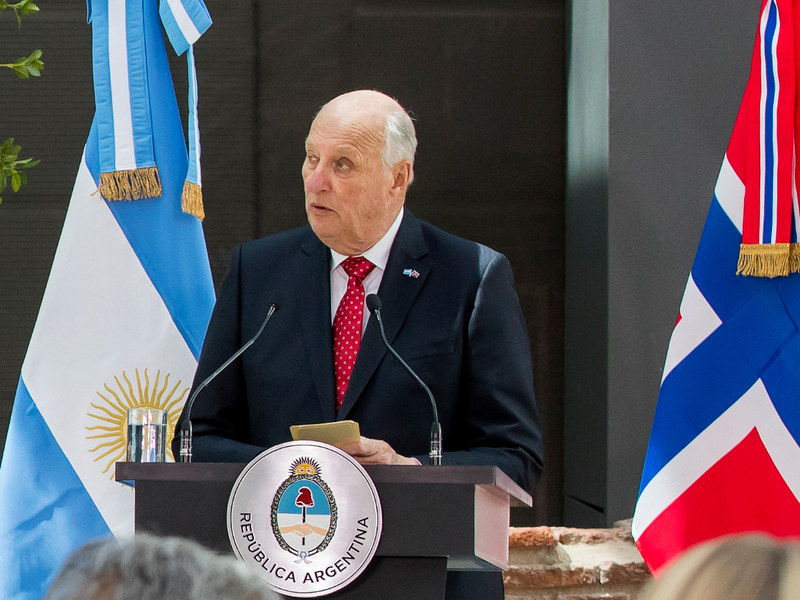 Speech given by His Majesty The King at Casa Rosada in Buenos Aires during Their Majesties' State visit to Argentina 6 - 8 March 2018. On behalf of the Queen and myself, I would like to thank you, Mr President, for your kind invitation to visit Argentina. This is a very exciting time in the development of relations between our two countries. The ties between us go back a long way. The latter half of the nineteenth century, when Norwegians started to emigrate to Argentina, marked a turning point in our relations. Argentina was one of the countries that received most Norwegian immigrants at the start of the last century. The dream of Argentina was strong. Mr President. Some of them were quite successful – like the influential businessman Don Pedro Christophersen, who was active in the business world and public life in Buenos Aires from the 1890s until his death in 1930. Among other roles, he was head of the stock exchange in Buenos Aires. He was also one of the founders of the Norwegian La Plata Society and the Scandinavian Rowing Club – which still exists today. Argentina continues to hold a dream-like fascination for many Norwegians. The Norwegian writer Karl Ove Knausgård has said that the working title of his international success, the novel My Struggle – was "Argentina’" He explains it like this: the book is about being at a place in life and wanting to be somewhere else – and Argentina had always been a sort of a dream country for him. Argentina’s celebrated author, Borges is – according to Knausgård, the incarnation of literature – and one of the reasons why the country was like a dream for him. In his own words: "It was the place of literature and myth, the place all my longing was directed towards." Today, visiting Argentina doesn’t have to be merely a dream – improved flight connections make it easier for more and more Norwegians to come here. I also hope more Argentines will take the chance to visit Norway. Maybe to experience the Northern Lights – and see how they compare with your own Southern Lights, perhaps? Or maybe we could share some secrets on how to ski? Perhaps you could teach us to become even better at playing football– a subject I know is close to the President’s heart. Our visit has attracted a lot of interest in Norway. It opens up new opportunities for cooperation in several areas. The extensive programme and our large delegation reflect this high level of interest. Quite a few Norwegian companies already have a presence here, and several are currently establishing themselves in Argentina. Agreements aimed at strengthening cooperation in a wide range of fields are being signed during our visit. This includes cooperation on trade and investments, and also cooperation based on defending human rights, promoting rule-based international cooperation and recognising our common responsibility to ensure sustainable development. Our two countries are far apart in geographical terms. But we share many common features and values – maybe precisely because of where we are located on the map. We share a proximity to the Poles and a common history in Antarctica – with activities ranging from adventurous expeditions to whaling. Perhaps these factors mean that we feel the effects of climate change even more strongly. We both harvest our rich natural resources. And this makes us especially conscious of our responsibility to use the resources in a sustainable manner – to the benefit of humankind. I would like to propose a toast to you, Mr President and to you, First Lady Awada, to the Argentine people, and to this new chapter in the history of the friendship and cooperation between our two countries.